The Invention of Fire - There Are Inkspots On My Page! 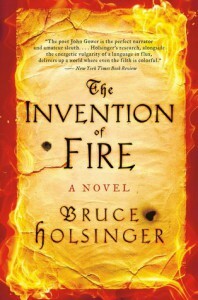 The Invention of Fire is the second John Gower book, but it’s not essential to read book 1 before you start this one. You’ll know more about John, but it won’t interfere with the story. I’m a sucker for a medieval mystery-type. They’re just a lot of fun. Despite being fiction, I almost always learn something new about the period - in this case, it was more about how the development of firearms changed society and warfare. I enjoyed everything about this book - it was well written, the story was good, the characters enjoyable. The underlying politics were really interesting (although I often find the convoluted feudal system hard to follow) and gave extra depth to the main storyline. I’m not head over heels for it, it’s not the Best Thing Ever, but it’s a very solid read and I did find it hard to put down once the story was established. One of these days I’ll even get around to finishing book 1!